Brand RELAXSO accepts a variety of payment methods (Credit Cards or PayPal) for online purchase. • If your card is new or recently reissued, make sure it has been activated. • Double check the card type (for example, Visa), the account number and expiration date. • Remove dashes or spaces from the account number. • If everything seems to be correct, call the card issuer's customer service number on the back of your card. Your credit card company may need to speak with you before they authorize your purchase. To prevent any unnecessary delays processing your order, please ensure that the billing addresses on your order matches the information on your credit card account. If you have recently moved or are unsure whether you receive your credit card statement at your work or home address, please contact your card-issuing bank using the customer service number on the back of your credit card to confirm. The card security code is a unique three or four digit number printed on the back (MasterCard/Visa) of your card, in addition to the account number. When you place an order, Relaxso will contact your credit card's issuing bank to confirm it is a valid account. Relaxso requests an authorization, which holds the funds for the full or partial purchase amount. As Relaxso prepares your items, authorized funds will be unavailable and may display as "pending" on your credit card's online statement. If you cancel your order before your items are billed, any authorizations placed on your credit card account can take up to 30 days to expire. Contact your financial institution for their specific timeframes. We accept: Visa® / MasterCard® / AmericanExpress® / JCB® / Discover® credit cards. If you are paying for your order with an international credit card, please note that the purchase price may fluctuate with exchange rates. Relaxso stores update exchange rates weekly. 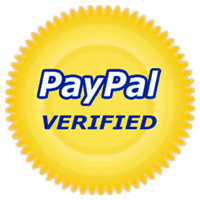 When you place an order with PayPal® you will be redirected to the PayPal website. There you will then need to login with your PayPal username and password. Before completing the order, check whether the total amount and billing details are correct. Even if you are not an existing PayPal customer, you can choose this payment method for todays' purchase and either set up a new account or pay as a guest. If your order consists of multiple deliveries, your PayPal account will be charged separately for each shipment. In accordance with state and local law, 8.625% sales tax will be applied to all purchases with a shipping address destined within New York State. No sales tax is charged when purchasing gift coupons; however, purchases paid for with gift coupons may be subject to tax.